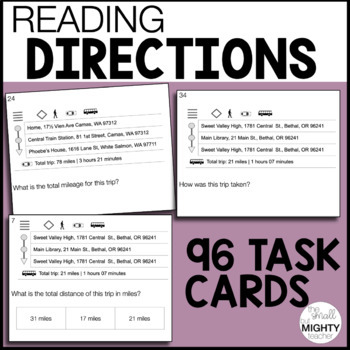 Life Skills / Special Education - this is a set of 50 task cards task students asking students to read and comprehend basic map directions (similar as to what is given on google maps, yahoo maps, etc). This is a great functional reading skill to practice with students as they work on job readiness, living independently and taking the bus/driving, etc. This is great for 1 on 1, small group and to laminate for continued use in task boxes! All you need to do is print and go! 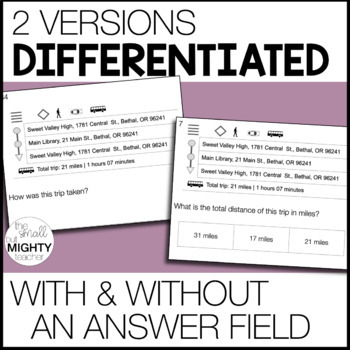 +50 task cards with "map" directions and then a question about the given directions, with an answer field of 2/3 (90%+ have 3 answer options). & you can follow me on Instagram at @thesmallbutmightyteacher!